The book tells two parallel stories. The first, on the morning of August 6, 1945 the United States dropped an atomic bomb on the city of Hiroshima. 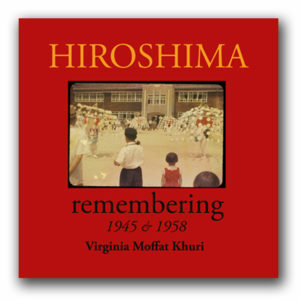 The second, on the morning of August 6, 1958 an American teenager spoke from the Children’s Memorial in the peace Park to the people of Hiroshima and the youth of Japan – and the world. These two ‘stories’ mirror each other on opposite pages: one an image, the other words, which somehow relate to each other. The first story is one of horror; the second, one of hope for peace on earth. The images are from transparencies were made by an exchange student to Hiroshima in 1958. They were taken by a 16 year old with no photographic experience using a borrowed 35mm camera lacking a light meter, auto-focus and film that had to be loaded into cartridges before leaving home. They were badly stored in an attic for 50 years and were so damaged that they were almost thrown away. But the light leaks and emulsion cracks might be reminiscent of the Atomic bombing thirteen years earlier and the dust could also be seen as the Black Rain that caused radiation sickness. Even the mundane street scenes caught on a bright sunny morning mirrored August 6, 1945.